Is it too early to start thinking about summer sewing? 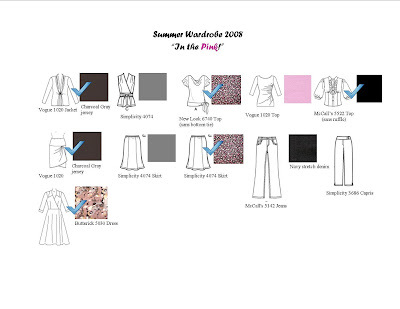 This is what I’m thinking about: a work and casual wardrobe for the summer. Okay, maybe jeans are too hot for summer, but I really want to make some; and then I’ll have them for the fall. Yeah, I have a lot of garments up here. 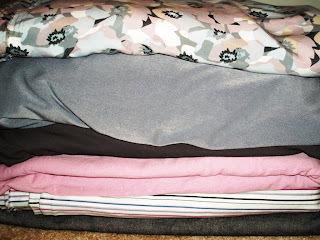 However, think most of the tops and the skirts will be relatively easy to make. And I tried to choose easy-to-care-for jerseys for most of the tops and bottoms, which I can throw in the washer/dryer and not have to iron. I also chose fabrics I won’t have to line. Lining takes up so much time, because you’re doing twice the work. My last SWAP had four lined garments. They came out well, but I just want to avoid that kind of work. Besides, with the fitted top I made and the jeans I’m planning, I’m sure there will be plenty of challenges to undertake with them. I don’t think I’m going to the the same number of combinations with this SWAP as the previous. The dress kind of throws things off, but I think it will go well with the Vogue jacket. I really wanted to make use of patterns that I already own. I haven’t set a time limit for this wardrobe; it will probably be an on-going project with other projects snuck in-between. I finished the black McCall’s 5522 top, and now I’m working on a blue version. I have also cut out the Butterick 5030dress. Then I have a UFO I’d like to finish; it will go well with my jeans. And then the Burdas…. I love your summer sewing plan. Pink and gray colors look great! I think about summer all year long ;o) You picked some really nice pattern and I love your colors choice. Another great swap to come… I’m excited! Certainly not too soon to start thinking summer. I love your selections. All the fabric and patterns you picked out are nice.I am loving sewing with knits.I only sew a few things.I used to be afraid of sewing with knits but I tried it and love it.I love the fact its wash and wear. Okay, you’ve inspired me to actually do a SWAP. This looks like it will be a wonderful wardrobe. I’ll check in to see how you’re progressing. I also love the colors you are working with!